he is so funny. Today at preschool they are to wear old clothes because they are making tie dye. I was concerned because all of Benji's shirts just about are Cars related and to get one messed up would not be a good thing. Anyhow, I got this idea and he went along with it. He is actually wearing a t-shirt and sweets. 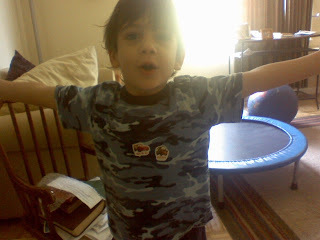 To keep him happy he has stickers on; one of McQueen and one of Mater. My silly Cars loving boy.